This week is all about wreaths on Design Improvised – one of my all-time favorite crafts to make! 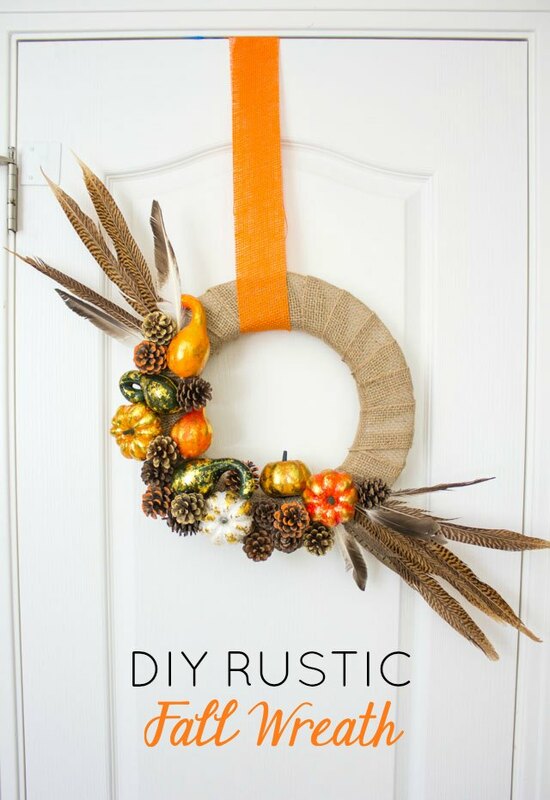 Today I have a rustic fall wreath for you that you can make in under in hour. It incorporates some quintessential fall materials – pumpkins, feathers, and pine cones – all available from Oriental Trading. 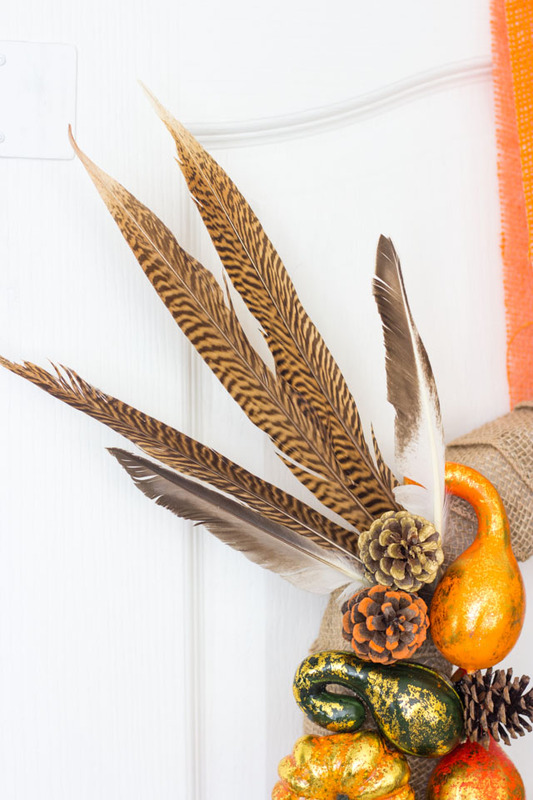 The result is once cozy wreath that you can display through Thanksgiving! I have mine on our pantry door to bring a good dose of fall into my kitchen. If you’re a wreath lover too, then don’t miss the colorful fall leaf wreath I made for our living room mantel, and stay tuned for a round-up of my favorite fall wreaths on Friday! Aren’t these pheasant feathers gorgeous? They added a fun element to the wreath and made it seem bigger when arranged diagonally on both sides. 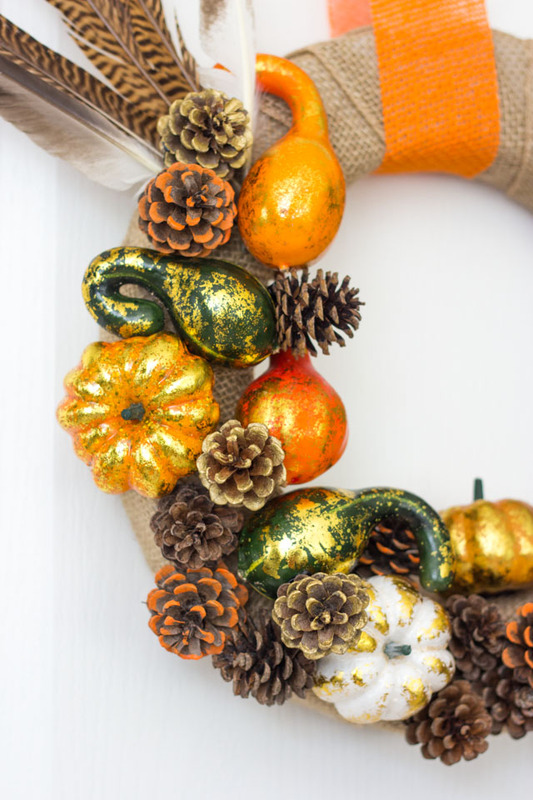 To decorate the wreath, I covered half of it with pretty metallic pumpkins and gourds and pine cones, some of which I embellished with a little craft paint to give them more color. The rest of the wreath I left bare so that the burlap could show. There are so many fun and inexpensive supplies like these pumpkins and pine cones available at this time of the year, so you can customize your wreath to make it your own! Head to Oriental Trading’s blog for the step-by-step rustic wreath tutorial and list of supplies!